Borage Family: Flowers united to form a trumpet. Flowers in a 1 sided coil, not unlike the shape of a coiled scorpion's tail. Leaves and stems often very stiffly hairy. Buttercup or Crowsfoot Family: Petals not joined. Petals either identical shape and size, or petals irregularly shaped (often with spurs). Numerous stamens. If yellow, petals are bright and shiny. Figwort Family: Petals mostly joined. Most flowers of this family have fused petals to form a fat tube opening into two broad lips. If petals are not joined, one looks much larger than the others. Stems are round. Gentian Family: Petals 4 or 5, fused the entire length to form a bowl or elongated vase. Sepals 4 to 5, united. Leaves alternate. Geranium Family: Petals not joined. Geraniums have flowers with 5 petals, 5 sepals, and 5 stamens. The central ovary has a long style that often looks beak-like. Harebell Family: Flowers regular or irregular (different sized petals). 5 petals and 5 sepals united as bowls or tubes. Flowers in loose racemes. Heath Family: Petals either joined and bell-shaped, or petals free. Flowers with 5 petals, 5 sepals and 10 stamens. Honeysuckle Family: Petals joined. Long funnel or bell-like flowers with 5 sepals and stamens. Leaves opposite. Mint Family: Petals joined. Square stems. Flowers long and tube-like ending in 2 lips. Leaves opposite. Oxalis or Wood-sorrel Family: Petals joined at base, free above. Compound, clover-like leaves. Flowers funnel-like. 5 stamens. Parsley Family: Petals not joined. Flowers are tiny, and arranged in clusters called umbels (The flower and seed arrangements look like an inside out umbrella.). Leaves often compound and leaf stems often clasp main stem. Pea Family: 2 petals (the lower ones which look like a pelicans pouch) joined, 3 are free of each other. Petals irregularly shaped. 2 sepals. The leaves are alternate and compound with leaf-like stipules where the leaf stem attaches to the main stem. Phlox Family: Petals joined. Flowers often look trumpet-like. 5 petals, 5 sepals, 5 stamens. Pink Family: Petals not joined. Leaves mostly opposite. Petals often notched at tips. Joints of stem often swollen. Purslane Family: Petals not joined. 2 sepals. Leaves fleshy. Rose Family: Petals not joined, and all are identical in shape and size. Many stamens. Leaves alternate, and with wide leaf-like stipules where leaf stem joins branch. Saxifrage Family: Petals not joined. 5 petals and 5 sepals, with 5 or 10 stamens. Flowers often cup-like or tube-like because of fused sepals. Stonecrop Family: Leaves and stems very thick, fleshy. Flowers often yellow, star-like, with 5 petals and sepals. Frequently found in rocky habitats. Sundew Family: Insectivorous plants with rounded leaves covered with sticky reddish hairs. Flowers white. Plants of bogs. Valerian Family: Joined petals. Petals irregularly-shaped. Sepals indistinct. 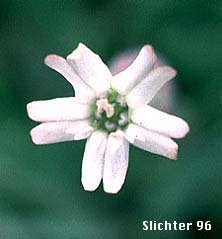 Fused petals often have a spur or bump at the base of the flower. Opposite leaves. Violet Family: Petals not joined. Petals are all differently shaped with 2 upper petals, 2 side petals and 1 lower petal.